Those hoping to avoid the cold might want to skip director Asif Kapadia’s latest ethnographically interested mini-epic, an adaptation of an Arctic-set story by feminist Sara Maitland. 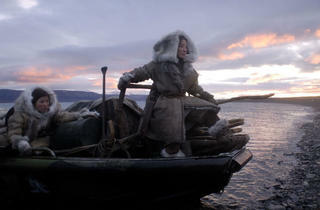 The tundra is as breathtaking as the acting is solid. Michelle Yeoh and Michelle Krusiec, decked out in Inuit chic, are suitably fierce as the cursed and lonely hunter and adopted daughter. They are ever canoeing or sledding together, away from their murderous fellow man, until Sean Bean’s half-dead escapee soldier falls in their path and divides them. It’s strange and eerie – in a bad way. It could be the Middle Ages, except for the radios and listening stations on the horizon. The politics are obscure too, with marauding groups suggestive of a fascist near-future. Themes of survival, savagery, maternalism and rivalry are unresolved. Disappointing.